Multiple Equipment Types e.g. Diesel Engines, Gearboxes, Hydraulic Systems etc. Multiple Condition Monitoring Techniques e.g. Fluids (oil, fuel, coolant), HUMS, Vibration etc. Supporting Information e.g. Asset Management, Usage, Maintenance History etc. We have a proven track record of achievements with a number of high profile customers. This includes more than two decades of experience working with the UK Ministry of Defence (all three services), other Armed Forces and major Equipment Manufacturers and we are the recognised provider of fluid sampling and analysis products and services to the British Army. Information regarding those key processes that are central to the delivery of the Machine Care Plus® service is available below. To view process information, click on the relevant box in the process flow diagram opposite. Please Contact Us with any enquiries or if you require further information. We would very much welcome an opportunity to discuss your equipment condition monitoring requirements. A representative fluid sample (oil, fuel, coolant) is taken in a safe and effective manner. Vital supporting information, such as identification of the sampled asset, accurate asset usage, and any maintenance or servicing carried out on the equipment since the last sample, is captured. This in turn raises the quality of data and information generated by the interpretation process. AES Ltd will liaise with potential customers and, after an initial consultation and assessment of customer requirements, we will advise on safe and appropriate methods for the sampling of equipment. AES Ltd can supply a range of specially designed sampling equipment, including sample bottle kits. Examples of the type of sampling equipment that we can supply are shown here. A sampling tap can be used for equipment with a pressurised oil system and a fixed oil sampling point. AES can supply the tap with adapter styles and thread sizes to fit most equipment sampling points. The vacuum pump is used for extracting oil samples from any equipment without a fixed oil sampling point, or from equipment with a non-pressurised oil system. The pump is used in conjunction with tubing and a sample bottle to enable a representative sample to be extracted via a suitable access point such as the equipment dipstick. The vacuum pump can also be used for coolant and fuel sampling. AES can supply a range of bottle kits containing sample bottles in various sizes and quantities. Bottle kits contain everything that the customer will require for dispatching samples for analysis, including envelopes for posting sample bottles to the laboratory. The kits can also include Sample Information Reports (SIRs) and SIR envelopes, should SIRs be required. The Sample Information Report is a basic form that when completed captures all of the key information relating to the sampled asset that is used during the interpretation process. SIRs can be supplied with bottle kits, if required, but the form can also be downloaded from the Machine Care Plus® website, and customers that have been supplied with a login to the Machine Care Plus® application have the ability to complete an online version of the SIR (e-SIR). Completed SIR forms are dispatched directly to the AES Early Failure Detection Centre (EFDC) for loading into the Machine Care Plus® online application, ahead of the interpretation process. Once a fluid sample has been extracted, it is sent to the laboratory for analysis. The range of tests carried out by the laboratory will be dependant upon the type of fluid, the type of equipment that the sample was extracted from, and the specific test package required by the customer. Click here for more information on the various fluid sample testing and analysis packages available. Sample test results are e-mailed to our AES Ltd Early Failure Detection Centre (EFDC) where they are matched with the corresponding Sample Information Report (SIR). EFDC personnel check and validate all of the information recorded on SIRs, as well as the corresponding sample test results, before entering the information into our Machine Care Plus® software application. The EFDC is the focal point for the Machine Care Plus® Equipment Fluid Analysis and Condition Monitoring Service. As well as validating fluid test results and equipment data, the EFDC’s highly experienced ex-military personnel also monitor the condition of our customer’s equipment, identify any signs of distress, and alert customers whenever action needs to be taken. The data is then interpreted by the Expert Decision Support System (EDSS) software. The EDSS is designed to integrate data collected from many sources, automatically interpret this data, and then output an accurate diagnosis together with corresponding recommendations/remedial actions aimed at improving machinery health and preventing failures. The data supplied to the EDSS is primarily obtained from fluid samples, but the EDSS is fully capable of accepting and utilising data obtained from alternative sources such as sensors (i.e. HUMS), usage meters, physical inspection results, and maintenance histories, etc. The EDSS is able to handle multiple equipment types and systems, including diesel engines, power transmissions and hydraulic, fuel and coolant systems. The EDSS output is checked and verified by EFDC personnel before being fed back to the customer in the form of a detailed assessment of equipment and fluid condition, together with corresponding maintenance recommendations. Once the diagnosis, health priority and maintenance recommendations have been committed to the system, users can securely browse or download their results from the Machine Care Plus® online application. There is an important distinction to be made between testing and interpretation. Testing produces data, whilst interpretation yields recommendations. 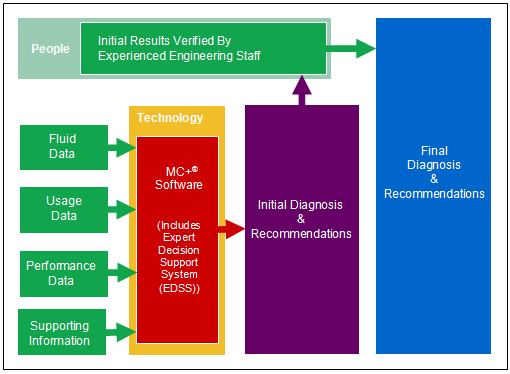 The testing and data flow process is displayed on the diagram shown below. The Machine Care Plus® online application provides customers with secure Internet access to all of their fluid sampling results. The application provides a comprehensive yet concise view of equipment information, equipment sample history, and sample test and analysis results, including prioritised sample health diagnosis and corresponding maintenance recommendations. It is also possible to record and display any servicing or maintenance tasks that may have been carried out on equipment. The application also includes a flexible and easy-to-use reports suite that enables customers to configure and download a range of comprehensive reports relating to sample analysis results and asset health. Click here to see an example report.